Dimitris Kotronakis was born in Heraklion, Creta (Greece), in 1973. At age seven, he began studying the classical guitar, and he graduated from the International Athens Conservatory with a guitar diploma in 1992 under the guidance of Vassilis Kanaras. Following this, he did post-graduate studies with Costas Cotsiolis at the Athens Conservatory, graduating again in 1996. He also undertook advanced theoretical and musicological studies that led to his diploma in Fugue, under Giorgos Sioras, and a degree in Musicology from the University of Athens in 1996. Additionally, he holds a doctorate from the same university (2014), under the supervision of Markos Tsetsos, in which he focused his studies on the guitar in Greece. He has so far recorded two CDs with music by Nikos Mamagakis, namely “New Excursion” for solo guitar and “Spring Synphony” for guitar and voice, based on poetry by Yannis Ritsos (IDAIA records - 2007). In cooperation with the guitar quintet “Epsilon” he recorded another CD titled “Angel guitars” (MBI records - 2006). His fourth CD titled “Echomythia” has been released in USA in the autumn of 2007 by the ClearNote publications. This disk contains pieces of the modern guitar repertory, influenced by the streams of Jazz, Latin and Brazilian music. In 2010, he recorded the “Amsterdam Concerto” by Thanassis Moraitis for the EMI Classics. It is included in the double CD named “Pictures of the sadness of the blond girls and of Eleni”. Dimitris performs as a soloist with the collaboration of the “Camerata” Symphonic Orchestra of Athens. In his sixth album, named “Our Old House”, (Clear Note 2011) he plays music for one, two and three guitars, composed by Kostas Mylonas. His last CD, titled “Toryanse”, has been released in spring 2016 in USA by Soundset Records. It contains again modern music works for solo guitar, from Greek and foreign guitar literature. 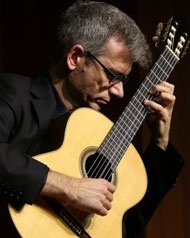 He has performed in numerous individual guitar recitals in Greece and worldwide; he has also co-operated as a soloist with the Philharmonic Orchestra of Kielce (Poland), the Philarmonic Orchestra of Craiova (Romania), the "Artave" Orchestra, Portugal, the Orchestra of Colors (Greece), and the "Camerata" Symphonic Orchestra (Greece). In the upcoming season performances are planned for Greece, Bosnia, Spain, China, Denmark, Canada and the USA. No less than the prestigious publication based in the UK Classical Guitar Magazine said about Dimitris’ recordings, “...the speed at which Kotronakis can “knock out” some of this music is quite breathtaking…this is a startlingly exciting recording which captures the amazing artistry of a very distinct player”. Dr Albert Kunze wrote in the Soundboard magazine: “...He sound like a one-man Quintet of the Hot Club of Paris…Kotronakis can really fly around the guitar”. The American Record Guide raved of him, “Fascinated Performance… Kotronakis plays with admirable conviction and control, with electrifying results”.